Back cover blurb: A gripping, heart-wrenching tale of love against the odds from the Number One Sunday Times bestselling author Dinah Jefferies. 1930, Rajputana, India. Since her husband's death, 28-year-old photojournalist Eliza's only companion has been her camera. 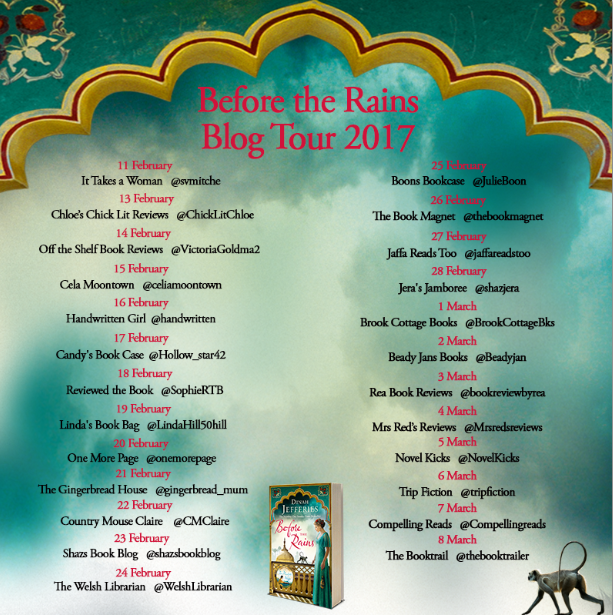 When the British Government send her to an Indian princely state to photograph the royal family, she's determined to make a name for herself. But when Eliza arrives at the palace she meets Jay, the Prince's handsome, brooding younger brother. Brought together by their desire to improve conditions for local people, Jay and Eliza find they have more in common than they think. But their families - and society - think otherwise. Eventually they will have to make a choice between doing what's expected, and following their heart. 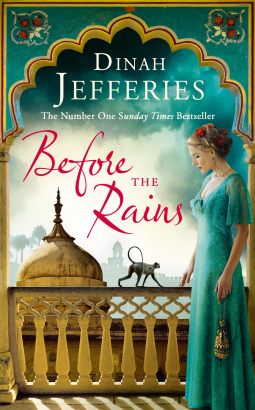 . .
Before the rains is yet another beautifully written historical novel by Dinah Jefferies. I really don't know how she does it. Every detail is perfect, you can really immerse yourself into 1930s India and almost believe that you are there. Eliza Fraser, recently widowed has accepted a British Government assignment to a princely state in India, where she is to photograph the Royal family. Determined to make a name for herself as a photographer, Eliza is nervous as she arrives. One of the first people she meets, Jay, instantly puts her at ease. But he is a member of the Royal family that she has been sent to capture film, so she realises that she should get close to him. Sadly, this is easier said than done. Vowing to help improve the conditions for local people, Eliza joins forces with Jay. As they make plans for the future of the local community their attraction to each other becomes undeniable. But Jay's family and Eliza's sponsor in India are against the two becoming close. Not only would it be unheard of for a member of Indian royalty to court and maybe even marry a Britsh woman, but Eliza is a widow. And in parts of the country they still believe in and practice the illegal custom of widow burning. Despite every little thing seeming to be against them, Jay and Eliza continue to grow closer. With their attraction to each other intensifying, and the world around them changing, they must decide whether to succumb to tradition or follow their hearts..
Before the rains is available now via Amazon online and all good book shops.